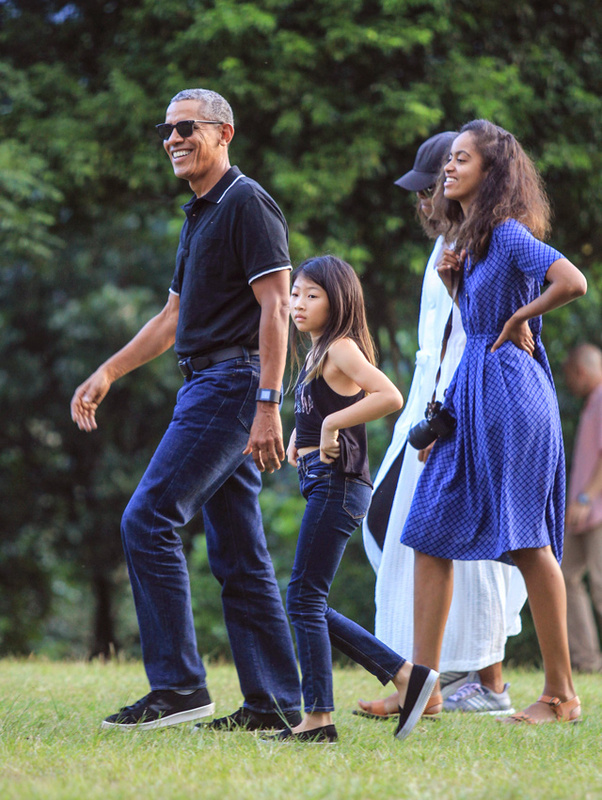 Former President Barack Obama and his family arrived Friday in his childhood home of Jakarta on the tail-end of their 10-day vacation to Indonesia, where they were spotted whitewater rafting and visiting ancient temples. Indonesian President Joko "Jokowi" Widodo will host Obama at the Bogor Palace in West Java, a grand Dutch colonial building famous for its 200-acre (80-hectare) botanical gardens and a herd of spotted deer that roam the grounds. Obama was incredibly popular in Indonesia during his presidency, and many here saw him as a symbol of hope and religious tolerance. A statue of the kid still remembered as "Barry" by childhood friends was erected outside the elementary school he once attended in Jakarta's upscale, leafy neighborhood of Menteng. "This is the last opportunity for us to meet with Barry, our childhood friend who has made us so proud," said Widianto Cahyono, who sat next to Obama in the fourth grade and is hopeful the former president will visit his old neighborhood. "We have long waited for a reunion with him." 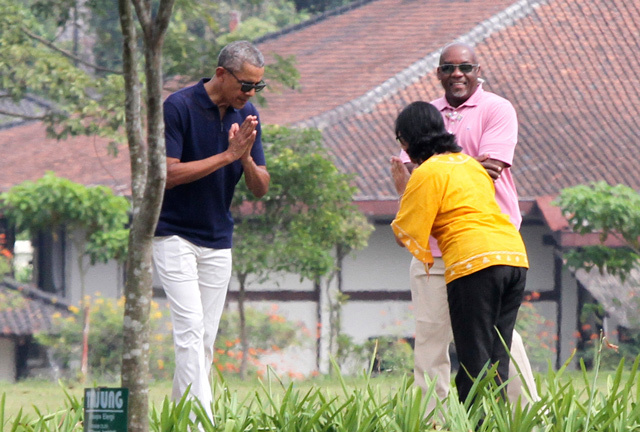 Obama also retains a soft spot for Indonesia, where he lived from age 6 to 10. He moved to Jakarta in 1967 after his mother split up with his father and remarried an Indonesian man. They had his half-sister, Maya Soetoro-Ng, who is traveling with the family. After her second marriage failed, Obama's mother, Ann Dunham, stayed on in Indonesia and Obama returned to Hawaii to live with his grandparents. During a 2010 presidential visit, he delighted onlookers by proclaiming in Bahasa Indonesia that bakso, a savory meatball soup, and nasi goreng, flavorful fried rice, are delicious. They are two of the country's signature dishes. 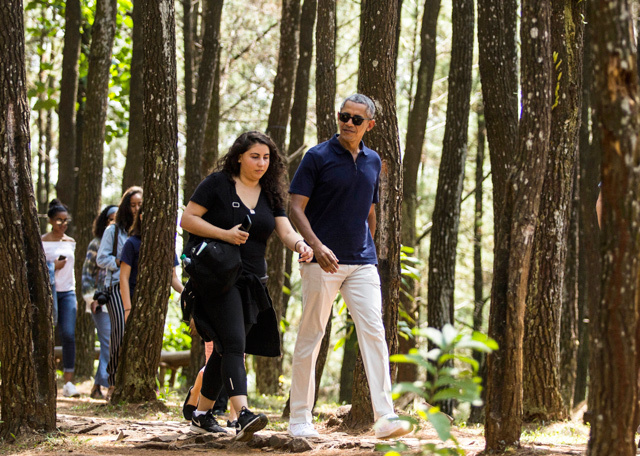 Prior to arriving in Jakarta, Obama, wife Michelle and daughters Sasha and Malia visited the resort island of Bali where they stayed in the tranquil mountain enclave of Ubud, toured sweeping terraced rice paddies and rafted the Ayung river. 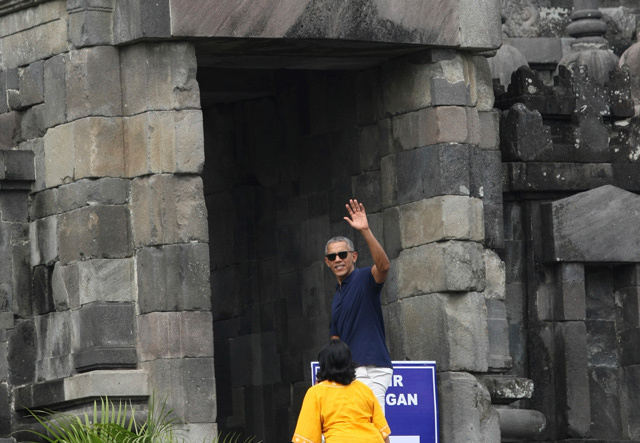 They then traveled to the historic city of Yogyakarta, where Obama's mother did anthropology research, and visited Borobudur, a ninth century Buddhist temple complex, as well as the ancient Prambanan Hindu temple. Obama is scheduled to speak at an Indonesian Diaspora Congress in Jakarta on Saturday.